After a rather sizeable correction from the Friday Bitstamp daily high of $2,741, bitcoin has entered a downward trading range. Volume has increased, but this is unfortunately mostly due to panic selling with buying volume unable to keep up. The recent push failed to breach the Gann 8/1 diagonal line. The plunge we are experiencing now has broken down below the 4/1 line once, but is holding above it at present. 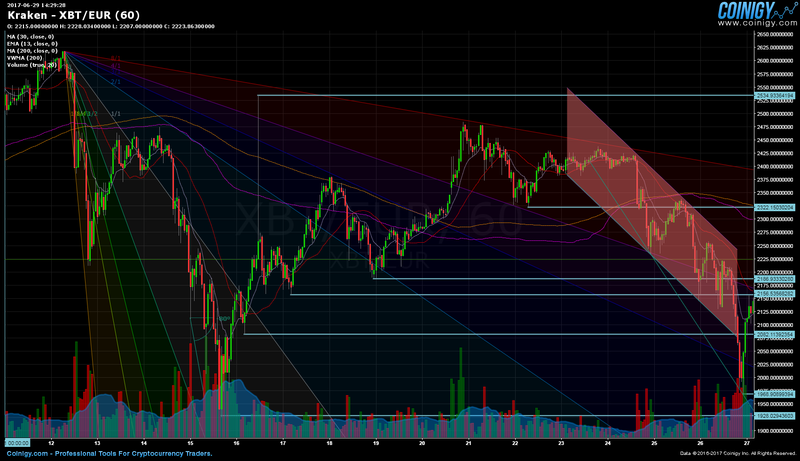 A period of stable trading is necessary before we can confirm a break in cohesion of the ensuing price movements. 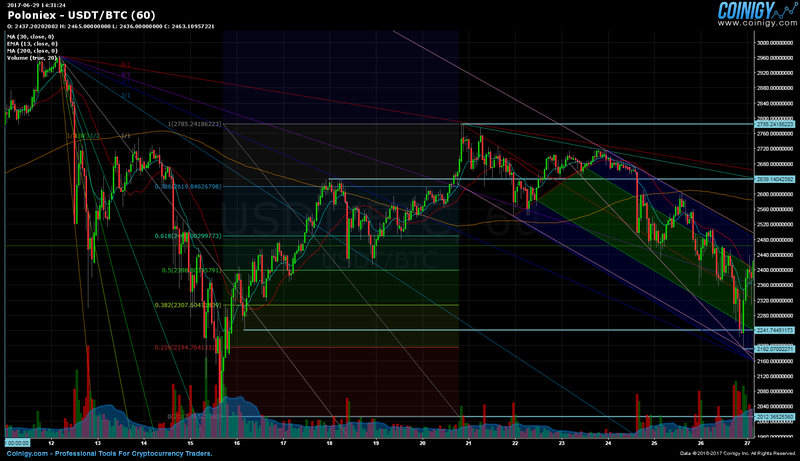 Key points for intersecting trend lines are at $2,306.87 and $2,253.26 respectively. Interestingly, $2,306.87 is also an important support level that is just above $2,195.52 and $2,120, which can both serve as possible footholds in the coming days. Intersecting trend lines at key points show an obvious downward trajectory. 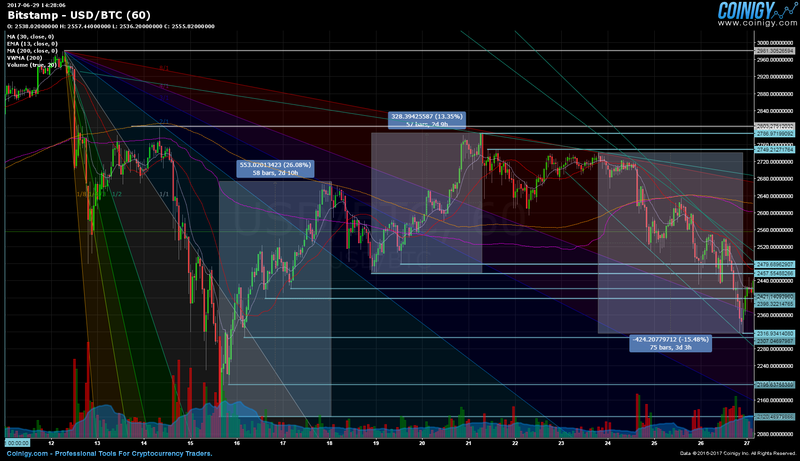 This may come to a stop in the next few days, should the ongoing sell-offs and the present flights to fiat complete. The euro and usd charts are almost identical in regards to price movement, so for added clarity I will use the chart below to focus more on euro support levels. Kraken has the most volume when it comes to euro denominated bitcoin trading, so buying and selling tends to be more in line with overall market sentiment. A possibly recovery was looking very likely until yesterday’s violent drop to €1,968.90, which was also Monday’s daily low and is now serving as key support. The breakdown invalidated a parallel channel that was rather elegantly forming. Had it held, it would have been a sign of a slowdown of this seemingly unstoppable downswing. The broken parallel channel is marked in red for easier reference. This is far from ideal, a widening descending range is very bearish and until there is burst of buying volume or dwindling of selling, caution is advised. Monday’s daily low has to remain untouched before we can call a potential bottom. €1,920 is a secondary support level, while this month’s low serves as a line in the sand at €1,787.16. Both could be markers for the next trading range should this dip continue further. Volume appears proportionally similar to Bitstamp when the larger euro trading volume is factored in. USDT price has remained relatively close to Bitstamp price movement, so we will focus on Fibonacci levels and trading within the reverse pitchfork. At 2,301.51 USDT, the current tether price is slightly below the 0.382 fib level (2,307.64 USDT). The 0.236 fib is also almost in perfect alignment with Monday’s daily low (2,192 USDT). Tether has in the past proven useful as an early indicator of potential bitcoin price fluctuations. Unfortunately, this is not the case at the present time, as there seems to be a rather high level of correlation between the two. Bitstamp’s US dollar/bitcoin pair began trading on June 23 at $2,717.96 (GMT 00:00). It was the start of an intense move down that finally culminated in a bottom at $2,316.93 on June 26 (GMT 20:08, a new Monday daily low). That low was the start of today’s minor price advance that ended up stopping at $2,463.81, which has additionally remained the new daily high for now. Trading has since oscillated between $2,316.93 and $2,463.81. Kraken’s euro/bitcoin pair began trading on June 23 at €2,403.90 (GMT 00:00). It was the beginning of a severe drop that finally hit a bottom on June 26 at €1,967.86 (GMT 20:08, a new Monday daily low). That low was the start of a weaker advancement that finished at €2,463.81, which has so far remained today’s daily high. Trading has since oscillated between €1,967.86 and €2,463.81. Poloniex’s tether/bitcoin pair began trading on June 23 at 2,683.35 USDT (GMT 00:00). It was the start of a strong drop that finally culminated in a bottom at 2,190.93 USDT on June 26 (GMT 20:08, a new Monday daily low). That low was the start of a rushed advance that finished at 2,460.89 USDT, which has so far remained as today’s new tether daily high. Trading has since oscillated between 2,190.93 USDT and 2,460.89 USDT. If you have any questions or comments concerning bitcoin or tether, please feel free to use and reply via the form below.